Republic workers’ picket signs echo Memphis sanitation strike of 1968. An important labor strike is happening in McDonough, Ga., just south of Atlanta. Workers at Republic Services/Allied Waste are members of Teamsters Local 728 who won their election in 2011. They began an unfair labor practices strike on April 15, caused in part by the illegal firing of a union supporter. Republic Services is a waste management company with contracts in numerous cities and counties across the U.S. It made $572 million in profits last year. Its single largest stockholder is Bill Gates, who owns some 25 percent of its shares. Republic has negotiated contracts in other locations, including Atlanta, that provide higher wages, holiday pay for Martin Luther King Day and other benefits that it refuses to give the McDonough workers. A big issue for these garbage workers who drive big trucks and pick up tons of waste matter every day is safety. They charge that the equipment is faulty and that repairs are not made despite their filing repeated reports. A day’s work can stretch to 14 hours or more. They say the company is cheating them by not paying for the time it takes to bring the truck back to the yard when their route is done. The company’s insulting response to the demand for a paid holiday on MLK day was to hold a barbecue for the employees that day. 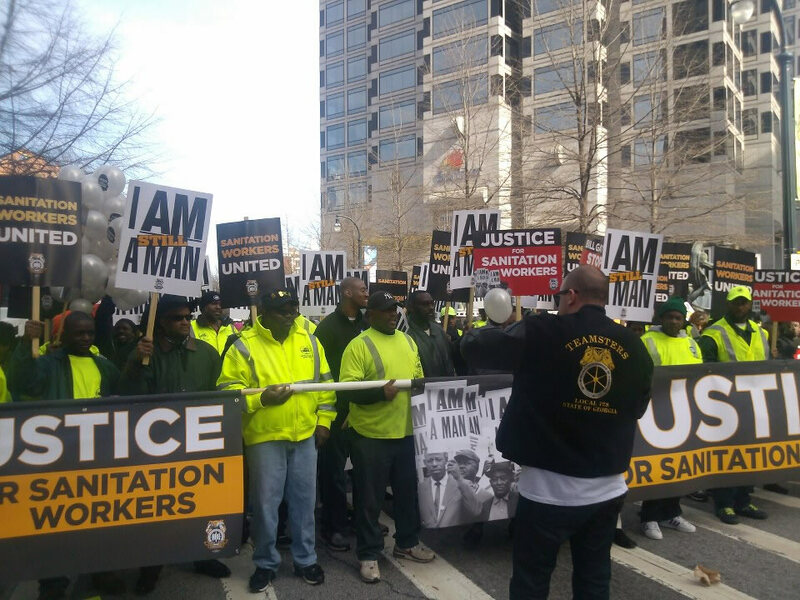 This past Jan. 21, many McDonough Republic workers marched with other area sanitation workers at the front of the annual King Day event in Atlanta. Of special significance was the presence of Memphis sanitation workers, whose struggle for a union and respect on the job brought Dr. King to that city 50 years ago. He was assassinated there on April 4, 1968. Republic workers are walking the picket line in other places, too. Outside Youngstown, Ohio, workers have taken on the company’s anti-worker stance. That strike began March 27, and sympathy walkouts spread to at least five other Ohio locations. Job actions at Republic facilities in California and Tennessee also occurred in this same time period. Following an interview with Republic strikers on “The Labor Forum,” a show on Atlanta’s progressive community radio station WRFG 89.3 FM, a temp worker who had been placed by his agency at Republic for a month called in. He said that when he saw the picket line on April 15, he refused to take the job. He knew them to be hard workers and he supported their efforts to be treated fairly. “I wouldn’t be able to look myself in the mirror if I didn’t stand with them,” he said. Similarly, a customer brought her garbage bags to the door of the Republic offices and told them to do right by the workers. The McDonough Republic workers have maintained a 24-hour picket line with high spirits and strong solidarity from other Teamsters and union activists. For additional information, contact Teamsters Local 728. 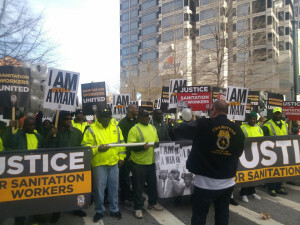 Check out the links below about the McDonough, Georgia Republic Services sanitation worker’s successful organizing campaign in 2011 and their participation, with workers from Memphis and Dekalb County sanitation, in this year’s Atlanta MLK march on 1/21/13. In early March 2013, the workers took over their company safety meeting with chants of “What do we want? Contract!” and announced directly to their management team that they had taken and unanimously voted in favor of the strike authorization. The Company responded with providing additional dates for bargaining. The workers intend to keep the pressure on until we reach a tentative agreement for fair and just collective bargaining agreement.